A three bedroomed semi-detached property positioned in this popular location to the north of Lincoln, just off Wragby Road. The property has an extensive blocked paved driveway providing off road parking for several vehicles and giving access to the garage at the rear of the property and a paved seating area. The property has internal accommodation to comprise of Inner Hallway, Lounge, WC, Rear Entrance, Kitchen, Dining Area, Sun Room and First Floor Landing leading to Three Bedrooms and Family Bathroom. Viewing of the property is recommended. LOCATION The property is located just off Wragby Road to the north of the historic Cathedral and University City of Lincoln. Lincoln has the usual High Street shops and department stores, plus banking and allied facilities, multiplex cinema, Marina and Art Gallery. The famous Steep Hill leads to the Uphill area of Lincoln and the Bailgate, with its quaint boutiques and bistros, the Castle, Cathedral and renowned Bishop Grosseteste College. There are regular bus services into Lincoln City Centre. INNER HALLWAY With UPVC door to the front aspect, doors to the lounge, kitchen, WC and rear entrance, stairs to the first floor landing, wooden flooring and radiator. KITCHEN 13′ 0" x 4′ 4" (3.96m x 1.32m) , with UPVC window and double doors to the sun room, tiled flooring, fitted with base units and drawers with work surfaces over, sink unit and drainer with mixer tap above, integral dishwasher, double oven and grill, four ring gas hob with extraction above, space for automatic washing machine and leading into the dining area. DINING AREA 16′ 5" x 10′ 5" (5m x 3.18m) , with UPVC window to the front aspect, tiled flooring, wall and base units with work surface over, integral fridge freezer and radiator. SUN ROOM 11′ 1" x 11′ 5" (3.38m x 3.48m) , with tiled flooring, UPVC windows and double doors to the rear garden. WC With UPVC window to the side aspect, tiled flooring, WC and wash hand basin. REAR ENTRANCE With UPVC door to the rear aspect and glass panelled door to the inner hallway. LOUNGE 10′ 5" x 16′ 4" (3.18m x 4.98m) , with UPVC windows to the front and rear aspects and radiator. 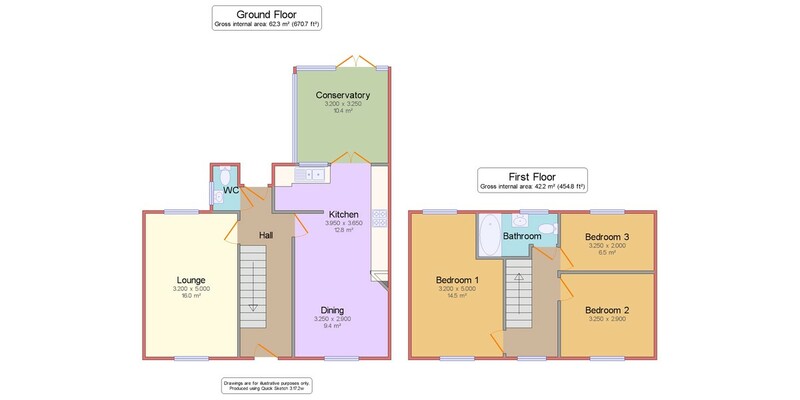 FIRST FLOOR LANDING With UPVC window to the front aspect, doors to three bedrooms and bathroom, access to the roof void and an over stairs storage cupboard housing the gas central heating boiler. BEDROOM 1 16′ 5" x 10′ 10" (5m x 3.3m) , with UPVC windows to the front and rear aspects and radiator. BEDROOM 2 9′ 9" x 8′ 9" (2.97m x 2.67m) , with UPVC window to the front aspect and radiator. BEDROOM 3 10′ 7" x 6′ 11" (3.23m x 2.11m) , with UPVC window to the rear aspect and radiator. BATHROOM 9′ 1" x 5′ 0" (2.77m x 1.52m) , with UPVC window to the rear aspect, tiled flooring, partly tiled walls, suite to comprise of shower, WC and wash hand basin with vanity unit and a chrome towel radiator. OUTSIDE To the front of the property there is a hardstanding area and a blocked paved driveway providing off road parking for many vehicles. To the rear of the property there is a garage, paved seating area, raised beds and two sheds. GARAGE 11′ 6" x 23′ 2" (3.51m x 7.06m) , with up and over door to the front aspect, UPVC window and door to the side aspect, power and lighting.